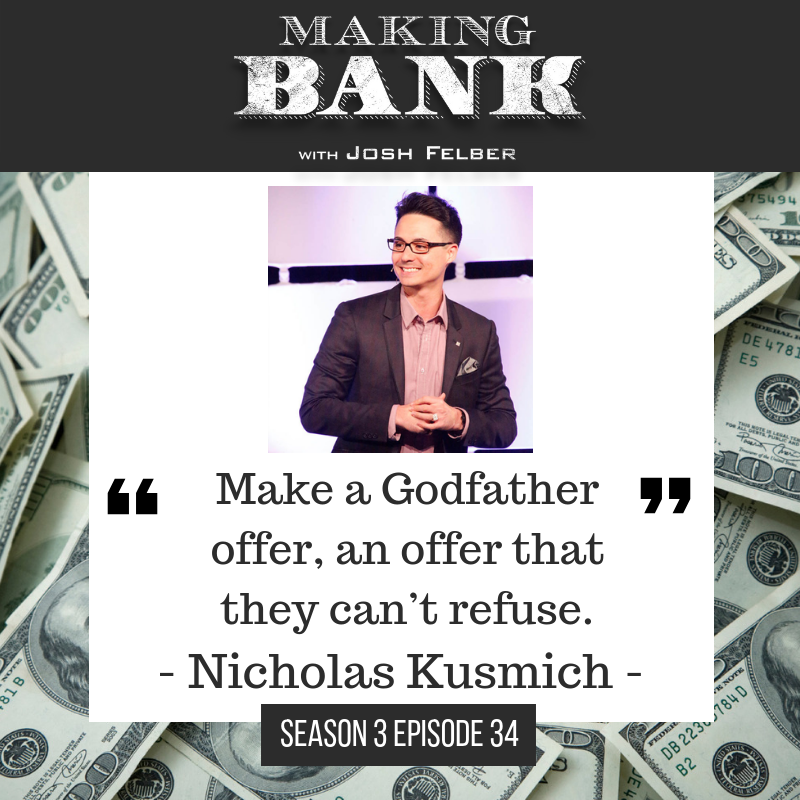 Nicholas Kusmich fine-tuned a system of invisible influence to get people to click, capture the lead, and convert it into a sale, that he’s tested in every industry possible. When you’re first diving in, the online ad space can feel incredibly overwhelming. This system helps break down the process into manageable chunks anyone can handle. But first, we need to take a step back and look at our expectations. An Ad is designed to get a click. A landing page is designed to capture a lead. A sales page is designed to get a sale. If you can keep that view, you’ll get a more accurate picture of where your succeeding and what, if any, cog is in the machine. So, first and foremost, are you getting the click? 80% of the success of your ad comes down to selecting the right visual or image, because of this, your image has to pop. Nicholas gave a lot of examples of how to do this. You can go black and white, turn your photo into a cinemagraph with one moving part, or increase the contrast. Resist the urge to stick a bold fluorescent border around the image. They look cheap and pull focus in a dated and obvious way. If it helps, keep Nicholas’ question in mind — If my image is a tree, how do I get a tree to stand out in a forest? Keep pushing yourself to stand out, especially from other businesses with similar offers. The #1 rule of marketing on Facebook is you must give before you ask. Facebook started as a place to connect with people and is still a place to start relationships. Treat it as such. Figure out what your ideal customer is actually looking for and reverse engineer something value that will give them what they are looking for without giving them the actual product. This is your lead magnet — typically a downloadable PDF. This works with e-commerce as well, you just might need to get a little more creative with what that material is. Something living in the realm of a how-to, recipe booklet, or education material will work. Once you’ve gotten the click and captured the lead, the worst thing you can do after this is sending them to a thank you page — that telegraphs “Okay we’re done here!” Instead, make them a Godfather Offer. You need to make them an offer they can’t refuse. Something that, for the right person who is interested in what you’re offering, makes them stop in their tracks. In this scenario, it is easy to put people in a pressurized situation with a short time limit. Nicholas advises against this. Instead, give them a window of a couple days to do their due diligence, speak with their partner, etc. You want to make the offer in such a way that it allows the right person to say yes, but that the wrong person isn’t offended by saying no. Leave everyone, even the people who say no, having a positive interaction with your company. This technique led to conversion rates spiking from 6% to 23% in cold traffic for Nicholas, simply by reminding people of the time remaining on their offer with 3 ads and 3 emails. Those are Nicholas Kusmich’s 3 C’s of Invisible Influence that, when deployed correctly, can make a massive shift in traffic and conversion. Finally, when you look at all three in harmony, do your best to keep the story congruent. The ad, landing page, and sales page should look like they belong together. If it feels like a totally different experience from one stage to the next, it will unconsciously trigger your buyer’s mind to say “This is unsafe.” So think about your color story, tone, palate, and fonts to ensure they all work together. To keep up with Nicholas you can find him on www.nicholaskusmich.com and Facebook Marketing Mastery.